A well hidden fact about Darwinism by the secularists is the fact that Darwinism promotes racism. One need only to examine the writings of Darwin to find racist implications from his work. For example, his well known thesis is titled, On the Origin of Species by Means of Natural Selection, or the Preservation of Favoured Races in the Struggle for Life. Few textbooks carry the whole title since the publishers and educators know there will be a backlash. However, the racist connection to his work is clearly evident. Darwin's work was used by Hitler to justify his murder of weak and sickly members of the human race. This included the handicapped, the mentally disturbed, and anyone that did not fit his prescription of the Aryan Superman. The ideas led to the extermination of the Jewish race. This work is a tour de force. 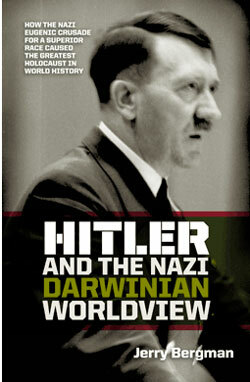 It is the definitive book on the relationship of Darwinism and Nazism. It finds painstaking support from hundreds of references to studies in Nazism, the Third Reich, Darwin, eugenics, and related subjects. The authorities on Nazism cited in this work include Richard Breitman, Christopher R. Browning, John S. Conway, Joachim C. Fest, Ian Kershaw, Leon Poliakov, Bryan Mark Rigg, Paul Roland, William L. Shirer, Hugh R. Trevor-Roper, Richard Weikart, and many others. Some unbelievers, obviously interested in attacking Christianity, have insinuated that Hitler and the top Nazis were devout Christians. This is very far from the case, as shown decisively by Bergman. One common misconception about ‘social Darwinism’ is that it was some kind of intellectual fad. Perhaps this was so elsewhere, but not in Germany! There it was taken very seriously, as made so obvious by this book, and made intothe central factor animating German political philosophy and action. The history of Pan-Germanism, or Deutschtum, followed the same path. While it long predated Darwin, it also only became genocidally virulent when connected to, and synthesized with, Darwinism. The same was true of German racism and German anti-Semitism. While it is correct that racism long predated Darwin, racism never expanded and flourished as much as it did in the 19th and 20th centuries—now elevated and legitimized by the imprimatur of scientific authority. In contrast to the usual works on Nazism that focus primarily or entirely on Jews, Bergman considers other victims. The first victims of the gas chambers were not Jews: they were the ‘Darwinian unfit’ Germans, such as the mentally retarded (p. 258). The Nazis also had genocidal plans for the Slavs. The Poles, and other Slavs, were Untermenschen (subhumans) who would live only as needed as helots for the Third Reich (pp. 44–45). The siege of Leningrad was planned to cause the starvation of the population (pp. 33, 215), whose surrender was not to be accepted even if offered. Martin Bormann (p. 166) pictured the German invasion of the USSR as a genocidal war against Slavs, and not just the military defeat of the Soviet Union and the elimination of Communism (p. 166). Himmler envisioned the initial phase of Operation Barbarossa, causing the death of 30 million Slavs (p. 188). 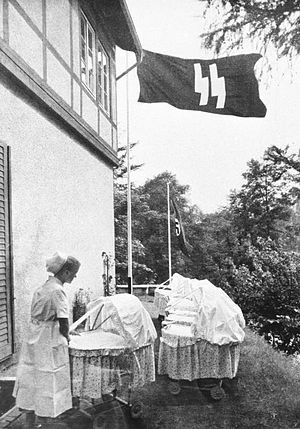 Some 250,000 ‘racially desirable’ Slavic children were kidnapped and raised as Germans according to theLebensborn program, and only a small fraction of these were reunited with their parents after Germany’s defeat. The Nazis ended up starving 3.6 million Soviet POWs to death (p. 167). Long-term Nazi plans had called for the replacement of the Slavic population in the conquered East, by German settlers, over a twenty-year period (p. 215). While it is correct that racism long predated Darwin, racism never expanded and flourished as much as it did in the 19th and 20th centuries—now elevated and legitimized by the imprimatur of scientific authority. Bergman quotes leading Harvard University evolutionist Stephan Jay Gould, who wrote that biological arguments for racism increased “by orders of magnitude” after the acceptance of evolutionary theory by most scientists (pp. 82–83) (figure 1). Considering the ultimate esteem that science and scientific progress held during the 19th and early 20th centuries, this takes on further significance. Figure 1. With the oft-repeated progression shown here, it was not difficult to think in terms of ‘more evolutionarily advanced’ and ‘less evolutionary advanced’ human races. This kind of Darwinian thinking was honed to perfection by Hitler and the other Nazis. Ernst Haeckel was the chief promoter of Darwinism in Germany. Soon after The Origin of Species had come out, he promptly translated it into German. Raised a Christian, he turned against his childhood faith, and especially scorned the Genesis account specifically for its teaching that all humans are descended from one set of parents (Adam and Eve, p. 112), as this implied equality of all peoples. Some atheists have advanced the silly argument that Darwin was banned in Nazi Germany. The exact opposite is the case. After the Nazis came to power, they promoted the teaching of Darwinism in the classroom as never before in Germany (see Bergman’s Chapter 16, pp. 265 on). Historian Daniel Gasman points out that in no other nation did the ideas of Darwin develop as seriously (p. 79). The proliferation of scientific literature devoted to this subject is telling. Before 1933, German scientists published 13 scientific journals devoted to racial hygiene and related topics. In the Nazi era, this exploded to nearly 150 scientific journals, many of which are still highly regarded today (p. 81). Moreover, Darwinian-based racism permeated all aspects of German life. This was so much so, that Professor Robert Lifton called the Nazi state a biocracy—that is, rule by biology (p. 106). As with racism, anti-Semitism has a long history. However, only the Nazis put it, alongside racism, in the framework of Darwinism, and elevated it to the point of an eliminationist philosophy backed by an active policy. Although the Nazis certainly used the teachings of Martin Luther when it served their purposes, it is manifestly incorrect to portray Luther as some kind of forerunner of Hitler. Luther’s quarrels with the Jews were entirely religious in nature, and never even hinted at Darwinian or eliminationist anti-Semitism. Luther’s ugly religious polemics were a response to equally ugly Jewish attacks on Jesus Christ. Placed in historical context, the abusive tone of religious polemics was universal at the time. For instance, Luther called the pope the anti-Christ, and then-faithful Catholic King Henry VIII returned the favour by calling Luther ‘the worst wolf of hell’. Luther also exchanged scatological vitriol with King Henry’s Catholic adviser, Thomas More (author of Utopia). Nowadays, racism is generally scorned in academia (except when used for identity politics by groups esteemed by leftists). Yet Darwinism is held as firmly as ever, especially when used as a weapon against religion. Nevertheless, we are told that it is ignorant to think that Darwinism justifies, or even implies, racism. So who got Darwin ‘right’? Is it the modern thinkers, or was it the earlier thinkers? In either case, why should we blindly trust intellectuals—as when they incessantly say that molecules-to-man evolution is factual beyond dispute? Taken to its logical conclusion, this attitude means that all those German scientists had fundamentally misunderstood Darwinism. This is difficult to accept. To begin with, Germany had the highest level of education in the world at the time (p. 205). Bergman points out that in the early 20th century the Germans stood at the very pinnacle of science. Up to WWII, German scientists won the lion’s share of Nobel Prizes, and scientists, the world over, had to learn German in order to read the scientific literature (pp. 103–104). Far from seeing Nazism as a misreading—much less misuse—of Darwin, German scientists enthusiastically supported the Nazis (p. 103), and there were only a handful of German intellectuals who dissented (pp. 128, 130). Nor was support for the Nazis a surrender to the inevitable. No scientist was forced to join the Nazi Party, yet more than 50% of biologists employed by the imperial institute did so (p. 125). Back in 1938, Austrian ethologist Konrad Lorenz joined the Nazi Party and dedicated his entire scientific effort to the furtherance of National Socialism (p. 125), which he publically supported wholeheartedly (p. 270). Decades later, in 1973, his willful Nazi past evidently overlooked, he (jointly) received the Nobel Prize for ‘discoveries concerning organization and elicitation of individual and social behaviour patterns’. Continuing the theme of the previous section, ‘Social Darwinism’ is commonly dismissed as a 19th century oversimplification—if not caricature—of Darwinism as ‘might makes right’ thinking, whether applied to racial politics, geopolitics, the battlefield, or the business world. After all, there are many different forms of Darwinian fitness in the natural world. There are numerous ways that an organism can be successful in passing its genes down to its offspring at the tacit expense of other organisms. For example, one organism may indeed possess Darwinian fitness through the ‘might makes right’ of being exceptionally skillful in fighting off attacks by predators. Another one, however, may acquire Darwinian fitness by an atypical ability of siring more offspring, thereby compensating for losses of conspecifics (and their genes) to predators’ appetites, and ensuring that its genes that encode prolific reproduction eventually become the norm in the population. While ‘might makes right’ was most certainly a part of Darwinism as understood and applied by the Nazi Germans, and as consistently manifested, for instance, with contempt for the Christian teaching of compassion for the weak (e.g. p. 59), it was hardly limited to that. Clearly, the Nazis already understood Darwinian fitness in much broader, and modern, terms. For instance, Haeckel understood evolutionary fitness in human evolution not only in terms of physical and mental prowess, but also in terms of “symmetry of all parts and equal development” (p. 79). The biology textbooks in Nazi Germany anticipated what now is called ‘kin selection’. The sacrifice of one’s own life can enable the passing on of one’s genes through one’s kin (p. 278). This is often used by evolutionists to explain the existence of altruism in nature. Ironically, far from having too narrow a concept of Darwinism as ‘might makes right’, the Nazis actually understood Darwinian fitness in terms that, by today’s standards, were too broad. For instance, German scientists believed that such human behaviours as criminality, divorce, hernias, ‘loving to sail on water’, etc., were all heritable traits subject to natural selection (p. 82)! The same held for the homeless (‘asocials’, p. 135). The Nazi belief that Jews, despite their intelligence, were inevitably afflicted with craftiness and immorality, meant that such traits were both heritable (pp. 69, 87). Furthermore, the sophisticated Nazi understanding of Darwinian fitness was converted into practical action. For example, eugenics in Germany was extended to the sterilization of people with schizophrenia, feeblemindedness, epilepsy, blindness, physical deformities, severe addiction to alcohol or drugs, etc. (p. 84). This implied that these traits were heritable, and subject to natural selection—the latter which could (and should) be accelerated by systematically removing the trait-bearers from the human gene pool. On the other side of the coin, the infamousLebensborn program (figure 2) included the supposition that such character traits as courage, loyalty, determination, sense of honor, etc., were heritable. Thus humans could (and should) deliberately be bred in order to make these traits more common among humans (p. 254). Finally, the Germans very much practised what they preached. They not only used Darwinism as a ground for persecuting and destroying other peoples, they also used Darwinism to persecute their own people, as noted above—all in the name of evolutionary advancement. This was no rarity. Bergman (p. 100) cites an estimate of at least 275,000 people, mostly Germans, euthanized for ‘racial weaknesses’ in this manner. Joseph Mengele is by far the best known of the Nazi doctors. He was responsible for many of the ‘selections’ at the Auschwitz-Birkenau death camp, and is known for his gruesome experiments on defenseless humans, including children. Bergman devotes a chapter to this man and his actions. The well-earned notoriety of Mengele should not obscure the fact that he was merely the tip of the iceberg. There were very many ‘Mengeles’. At least 400 German doctors are known to have conducted heinous acts against human beings, but only 20 of these were ever tried for these crimes (p. 142). No German doctor was ‘following orders’. Pointedly, no doctor was forced to participate in euthanasia. In fact, Hitler’s original 1939 memo, in this regard, was an empowerment (Vollmacht), not an order (Befehl) (p. 139). The physicians’ participation in the Nazi Darwinian program was hardly accidental. Already in 1933, according to Professor Michael Kater, German physicians had been overrepresented in the Nazi Party and its adjunct organizations (p. 133). Were these physicians, in spite of all their training in biology and related fields, all ‘misunderstanding’ Darwin? “We know that Hitler read many books on eugenics, racism, and related topics because he tended to mark up the books he read, even adding his penciled notes to some.” (p. 38). One striking feature of Bergman’s work is how frequently Darwin became the faith-killer among leading Nazis, who had earlier been raised as devout Christians. This was notably true of Joseph Mengele (pp. 149–150), Heinrich Himmler (p. 178), and Joseph Goebbels (pp. 191–192). Thus, in their young adulthood, these ‘Darwinized’ college students became easy prey for Nazi ideology and the personality cult of Hitler. Detractors of Christianity commonly point to certain of Hitler’s pronouncements that were favourable to Christianity as proof that Hitler was friendly towards Christianity, if not an active Christian himself. What are we to make of this? Figure 2. The Lebensborn program in action. Politicians are prone to tell people what they want to hear, and what they say is commonly an act of posturing. Hitler was a good dissembler, and it is not surprising that some church leaders believed that Hitler was, at worst, benign towards Christianity (p. 67). Owing to the fact that the German church was strongly compromised by worldliness (for instance, generally accepting Darwinism), and most of German Christianity was based on culture rather than conviction, it is not surprising that much of the church believed Hitler in what they wanted to be true. It is also hardly surprising that Hitler invoked Christian themes as he tried to paint himself as a saviour of the German people from their real or imagined misfortunes, and, later, also an anti-Bolshevik crusader. [In doing the latter, he conveniently forgot his earlier alliances with the Communists, notably with the Soviet Union in 1939–1941, as against Poland]. As the Third Reich was breathing its last in 1945, Hitler made many irrational statements. This included his insistence that he would still emerge victorious. His ‘pro-Christian’ statements at that time must be seen in this light (p. 303). Scholars, including George Constable, Ian Kershaw, and Allan Bullock, agree that Hitler largely hid his anti-Christianity for tactical reasons (pp. 13–14, 64). He could not afford to make war against the church while fighting other enemies. In addition, the ill-conceived actions of Joseph Goebbels and Julius Streicher must have served as a warning. Goebbels’ and Streicher’s frequent scurrilous attacks against Christianity had only provoked an angry backlash, even among nominal German Christians (pp. 198, 250). Despite Hitler’s public posturing as neutral to friendly towards Christianity, he even then sometimes showed his true colours in his actions. He reportedly enjoyed anti-Christian literature, and made hostile public statements against the church and the clergy (e.g. p. 64, pp. 13–14). In one of his diaries, Goebbels characterized Hitler as “deeply religious but deeply anti-Christian” (p. 199). Except for a brief period in early childhood, Hitler never was even outwardly religious. He increasingly identified with his agnostic father. And during later childhood, persistently refused his devout mother’s entreaties to attend church with her, even though he dearly loved her (p. 57). Even in his late childhood, as remembered by a childhood friend, Hitler enjoyed books on the Inquisition and other topics that seemed to discredit the church (p. 57). To understand fully what Hitler really thought about Christianity, one has to examine what he said in private to trusted staff. Alan Bullock quotes Hitler as calling Christians “filthy reptiles” taking advantage of Germany’s weaknesses, and repeating Jewish-invented fairy tales (p. 303). Historian George Constable points out that Hitler said privately that he wanted eventually to stamp out Christianity in Germany, “root and branch” (pp. 13–14). Hitler himself once said, “I myself am a heathen to the core.” (p. 57). So much for the myth that Hitler was a Christian in any way, shape, or form. What would have happened had Germany won WWII? Interestingly, Bergman calls attention to a lengthy item, dating from the Nuremberg Trials, documented by prosecutor William Donovan, found in the Cornell University archives. Called the Nazi Master Plan, it planned the eventual elimination of churches in Germany (p. 9). This work includes an assortment of little-known facts. For instance, Hitler’s alleged Jewish ancestry has long been a subject of speculation. A genetic study has verified the fact of Hitler’s partial Jewish ancestry—as discussed in an article in the Jewish World (p. 53). Soon after imposing the Nuremberg Laws, the Nazis confiscated the Jews’ firearms (p. 23). Nowadays, at least reflecting the anti-Christian spirit of much of the West’s academia and media, we hear statements asserting that the church was essentially complicit, if only by its silence, in the unfolding Holocaust. Ironic to this, none other than Albert Einstein had praised the church, in 1940, for having stood up to the Nazis longer than any other institution in Germany, a fact that won Einstein’s newfound praise for the church (p. 70). There is a wealth of evidence showing that Darwinism played a major, if not central, role in Nazi attitudes and actions. The same holds for evidence that, far from being Christians, Hitler and the other Nazis were very anti-Christian. The Nazi German understanding of Darwin and Darwinism is very much at variance with modern conceptions of the same. Did the Nazis and all the intellectual heavyweights supporting them ‘misunderstand’ Darwinism, or did they—unlike modern academics—correctly face up to the full implications of the Darwinian position?